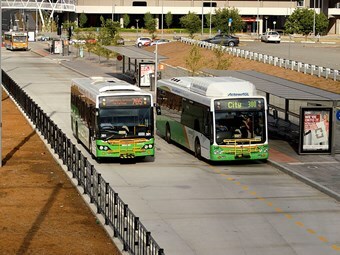 A survey started this week asking Canberra residents what they want in a real time bus system for the ACT’s Government’s Action bus network. ACT Minister for Territory and Municipal Services Simon Corbell says the recent territory budget’s $12 million allocation for a real time passenger information system would see a bus tracking system developed and rolled out over two years. He says the system would be designed to increase consumer satisfaction with the service and provide up-to-date information about how far away the bus is from a bus stop during its run. "The recent announcement of the successful tender for the first stage of this project has generated a lot of interest and the ACT Government is consulting with the community and key stakeholders to ensure that the system meets the needs of all commuters," Corbell says. A real time passenger information system will see digital displays installed at major bus stations and other selected bus stops, providing commuters with instant information over the internet, mobile phones, touch screen displays and on bus visual and audio displays. Corbell says a real time passenger information system in Canberra would be a positive step forward to further improving the delivery of public transport services to the community. "The implementation of a real time bus system will improve access to public transport through electronic media channels, and to increase public transport utilisation and patronage," he says. Corbell plans to include ANU students working in real time tracking to ensure their views are being taken into account, and to see how they can be involved in the project. The system’s Installation is expected by mid-2012, becoming fully operational by 2013. The survey closes on Friday, August 26.